The Age of Exploration (also called the Age of Discovery) began in the 1400s and continued through the 1600s. It was a period of time when the European nations began exploring the world. They discovered new routes to India, much of the Far East, and the Americas. The Age of Exploration took place at the same time as the Renaissance. Outfitting an expedition could be expensive and risky. Many ships never returned. So why did the Europeans want to explore? The simple answer is money. Although, some individual explorers wanted to gain fame or experience adventure, the main purpose of an expedition was to make money. How did expeditions make money? Expeditions made money primarily by discovering new trade routes for their nations. When the Ottoman Empire captured Constantinople in 1453, many existing trade routes to India and China were shut down. These trade routes were very valuable as they brought in expensive products such as spices and silk. New expeditions tried to discover oceangoing routes to India and the Far East. Some expeditions became rich by discovering gold and silver, such as the expeditions of the Spanish to the Americas. They also found new land where colonies could be established and crops such as sugar, cotton, and tobacco could be grown. 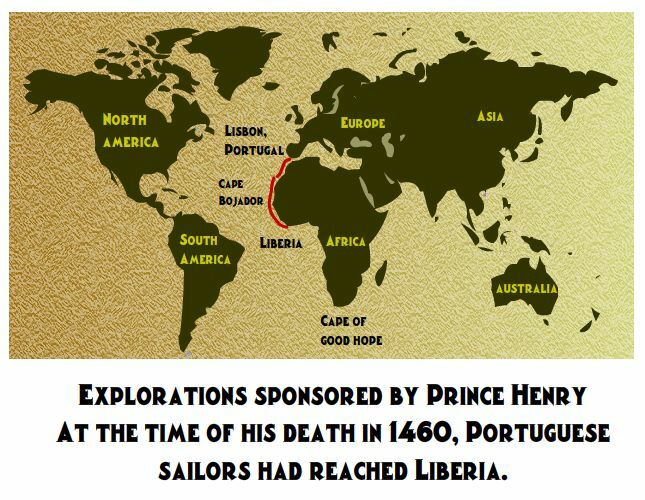 The Age of Exploration began in the nation of Portugal under the leadership of Henry the Navigator. Henry sent out ships to map and explore the west coast of Africa. They went further south than any previous European expedition and mapped much of western Africa for the Portuguese. In 1488, Portuguese explorer Bartolomeu Dias was the first European to sail around the southern tip of Africa and into the Indian Ocean. Soon the Spanish wanted to find a trade route to the Far East. Explorer Christopher Columbus thought that he could sail west, across the Atlantic Ocean, to China. He could not get the Portuguese to fund his expedition, so he went to the Spanish. Spanish monarchs Isabella and Ferdinand agreed to pay for Columbus' trip. In 1492 Columbus discovered the New World of the Americas. Portugal and Spain became the early leaders in the Age of Exploration. Through the Treaty of Tordesillas the two countries agreed to divide up the New World. Spain got most of the Americas while Portugal got Brazil, India, and Asia. Spain sent over conquistadors to explore the Americas and to conquer the peoples there. 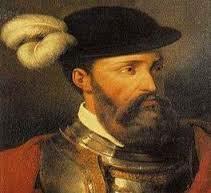 Hernan Cortes conquered the Aztec Empire in Mexico and Francisco Pizarro conquered the Inca Empire in Peru. They made Spain rich with the gold and silver they found in the Americas. Portugal sent out Vasco da Gama who found a trade route around the southern tip of Africa and to India. They also explored much of the Far East and were the first Europeans to establish a trading colony in China at Macau. Other countries such as Great Britain and the Netherlands established colonies in the New World. Eventually Great Britain would surpass all of the European nations in terms of the size of their world wide empire including the thirteen colonies in the Americas that later became the United States. 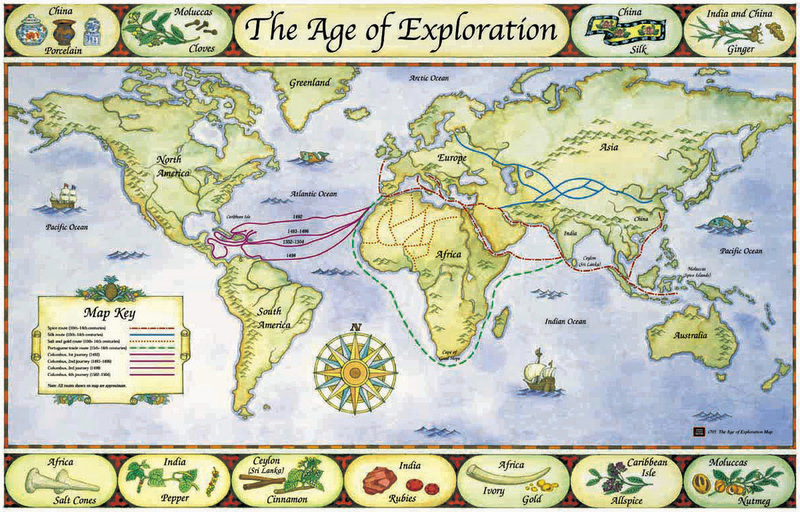 The Age of Exploration was one of the most important times in the history of world geography. A significant portion of the unknown world was mapped during this short period. Also, many advances were made in navigation and mapping which helped future explorers and travelers. During the Age of Exploration Europeans referred to the entire area of Southeast Asia and India as the "East Indies". The first expedition to circle the globe was led by Portuguese explorer Ferdinand Magellan. Unfortunately, Magellan was killed during the expedition and did not complete the voyage. Some areas of the world were not fully mapped or discovered until well after the Age of Exploration including Eastern Australia, the interior of Africa, the Arctic, and the Antarctic. Many explorers such as Captain James Cook and Sir Francis Drake searched for a Northwest Passage to East Asia, but it wasn't until 1906 that explorer Roald Amundsen completed the journey.